Have we been told the truth about the alleged terror attack on Westminster Bridge, London in March 2017? The incidence occurred on 3/22 (March 22) 2017, exactly a year after the Brussels terror event on the same day last year, that in itself is very suspicious. The video and photo evidence of the Westminster attack suggests it was all staged and the only death may have been the Policeman’s. He may have been sacrificed to give the whole event some reality. False flag staged attacks are psychological warfare operations targeting the minds of the masses. Fabricated events can be used to further an agenda of the deep state and the perpetrators typically include CIA, MI6, MI5, MOSSAD, and DGSE (French Intelligence). The Muslim or Arab patsie is sent there to do the crime or blackmailed into doing it to enforce the idea to the world that the “boogieman” Muslim terrorist is still real. If this was a white man that allegedly drove this car along the bridge then it would not be classed as a terrorist event, only because this man was classed as a ‘Muslim’ is it then labelled a terror event. Look at the incident in Times Square, New York on May 18th 2017 were a man mowed down 20 pedestrians and killing one, it was labelled by Police as not a terrorist incident in fact New York Mayor Bill de Blasio said there was "no indication" it was an act of terrorism and this was because the perpetrator was not a Muslim. 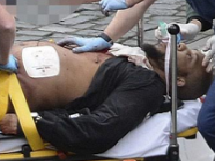 We are told the person who carried out the Westminster attack was Khalid Masood (Adrian Russell Elms) who was a Christian until he allegedly converted to Islam in 2005, so he is not really a Muslim. What did this Muslim have to gain from this event, what was his objective in carrying it out, well he had none whatsoever. These false flags are now becoming so obvious with so many mistakes. The mainstream media never bothers to bring up the anomalies or mistakes just like they did with 9/11 or 7/7 and that is because they are controlled and they are there to repeat the governments version of events. Let us look at 13 reasons why this could be a fabricated or staged event. The first piece of evidence is the video below which shows the only footage known of the car that was reported to have been involved in the Westminster terrorist attack. First the car looks more like a cartoon or ghost car in comparison to the other vehicles on the bridge. The video is below if you want to look at it. Look at the splash in the water on the video below, the splash is followed by a black streak. What is the black streak or trail? It is CGI, not real. Notice how the person (if it was a person) jumped into the water after the car has already gone by. Research has shown that the building were this video was taken was the upper half of the Milbank Tower which houses the Government/Political agencies. In the past and in the present Milbank Tower has been used by a cluster of predominantly political organisations including the Conservative and Labour parties and the United Nations to name a few. Today it hosts a wide range of companies from PR agencies to the Ministry of Justice Records Management Service. One company in the Milbank Tower is Altitude London which was opened by former PM David Cameron in 2010. Altitude states on its own website it is: “A firm supporter of the UK film industry and arts in general, Altitude has helped some of the foremost film and television production companies gain footage that is just not possible anywhere else”. 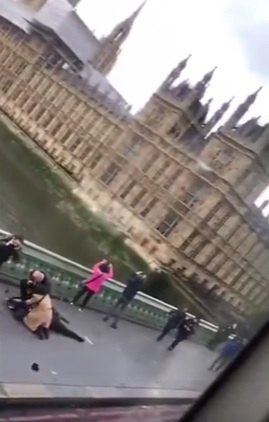 So we are led to believe the person who took this video just happened to have a video camera pointed at Westminster Bridge when this alleged car started its journey. What a coincidence? I don’t think so, they were part of the staged attack. The one thing that looks really odd is that the attacker was able to drive at speed over Westminster Bridge and mow down pedestrians. It is a very busy bridge – why was it empty enough for anyone to drive at speed at that hour? It should have been jam packed with traffic – you would be lucky to do 10mph! If one looks at the pictures afterwards, there are several buses and cars stopped on the South bound lane … but almost nothing stopped on the North bound lane used by the attacker, that lane is almost empty. What a coincidence? 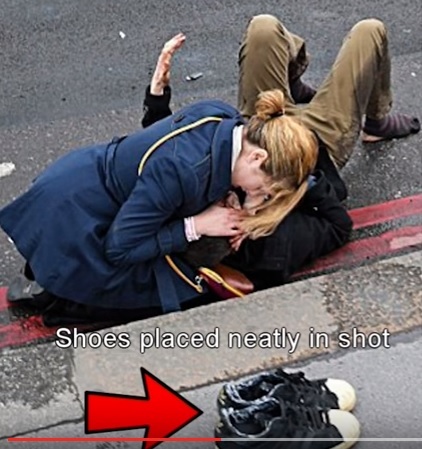 Did you know nearly all the photographs of the Westminster attack which were used by the media were taken by Toby Melville a photographer for Reuters based in London? Reuters Media, we know is owned by the Rothschild’s. You could say Melville is an elite photographer because he took the photo of Kate Middleton’s baby when it was first shown to the world as well as many photos of the Queen and Obama when he visited the Queen. Melville took the photo which shows a woman’s pair of legs (it was a mannequin) sticking out from under a bus during the Westminster attack. 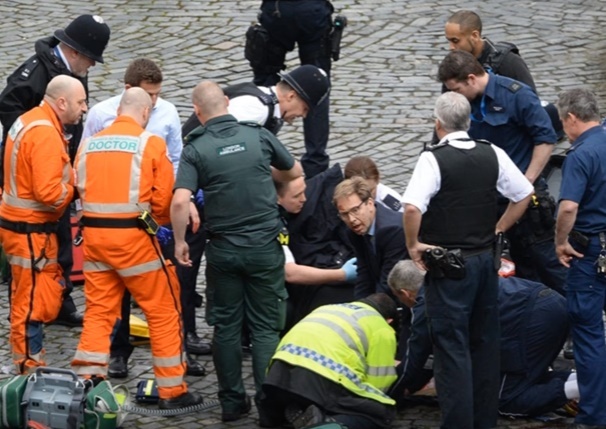 Other photographs of the events of the attack were taken by one Stefan Rouseau who states on his website that he has spent the past 15 years travelling with and taking photographs of the Prime Minister. So all the photographs of the Westminster attack were taken by trusted Government/Royal photographers, two high profile insiders. There is no footage from people’s phones and they would be because on the other side of the road there was a queue of traffic with several buses, so someone would have taken videos and photos but there is none available. The two pair of legs sticking out from under the bus do not belong to a human being, it is a dummy or mannequin. We are told this woman got hit by a car and then the front wheels of a double decker bus went over this woman and then the back wheels went over this woman. Does any sensible person believe that? Where is the blood, if a 12 ton bus went over you twice there would be blood and your body would be squashed? It is not believable. It looks like this dummy was placed under the bus for shock effect meant to manipulate public consciousness. As mention earlier this photo was taken by Toby Melville. The hand looks to white to be the hand of a human and why would your shoes be off? I love the way the cop is just walking by as if nothing has happened! Just a double-decker bus driving over someone, nothing special, don’t’ even try to help her. Now this piece of evidence for me makes this Westminster attack to be nothing more than a false flag hoax. 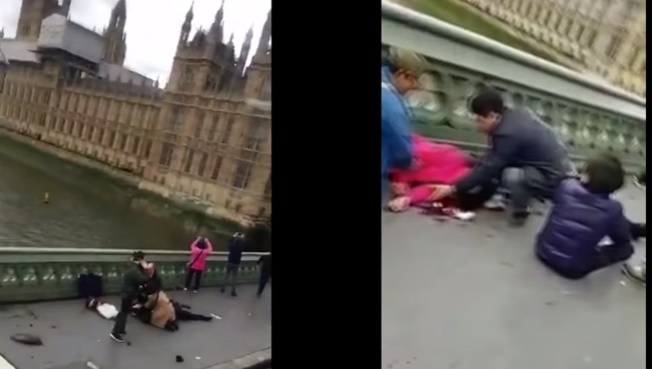 Now there is a few videos on Youtube which shows videos of someone moving along Westminster Bridge just after the alleged car mowed down pedestrians. 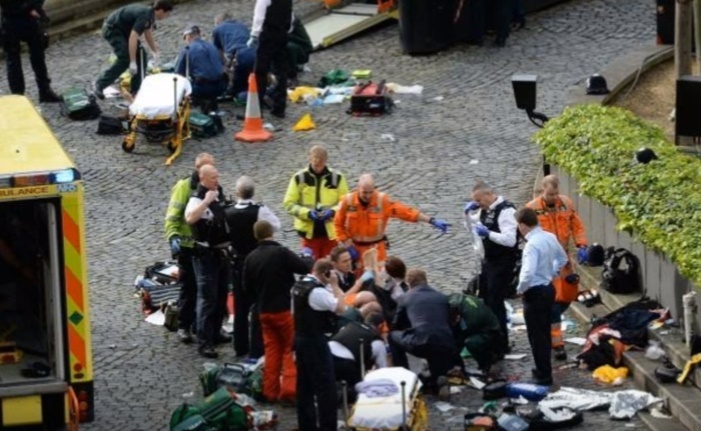 It shows alleged injured people on the floor been attended to by members of the public. 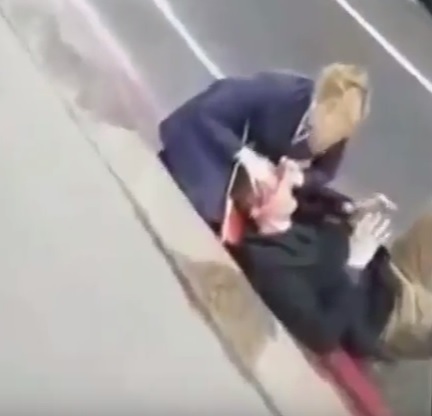 Below is a screenshot of an alleged injured person been attended to and standing near is a lady in pink holding her arms up taking photos and near her is a man also taking photos and he has blue\grey jeans and a dark grey jacket on. 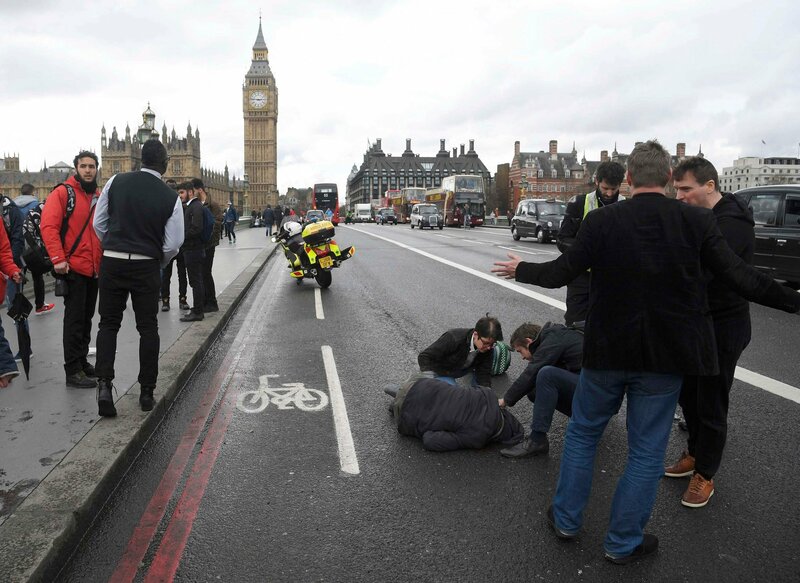 At the point that the lady in the pink jacket is taking photos, the car that allegedly mowed down all the pedestrians has already gone along past were she is standing because there is an injured person already near her on the floor. A screenshot is below. 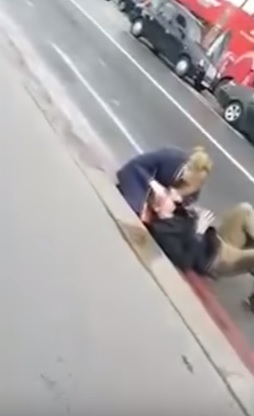 Do you get that, the lady in pink was not hit by the car. 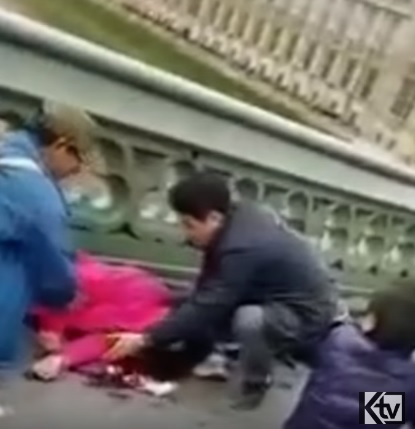 Now there is a another video of her lying injured in the same spot with blood near her as if she has been hit by the car and the same man standing next to her taking the photos is now acting as her helper. The screen shot is below of her lying injured. She was not hit by the car, it is a staged scene and she is an actor and probably paid huge sums for this fakery. Notice the man helping her, it is the same man who was stood near her taking photos. Also would you really take photos if there was someone lying next to you injured? Shoes were placed into a scene for some unknown reason. Since when does a car hitting you knock your shoes off? Here we have a photo which shows a man being attended to and there are no shoes by the side of the road. 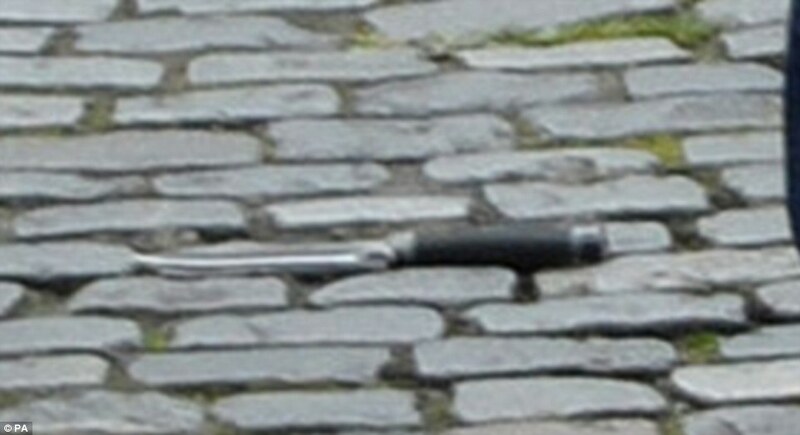 We now see a photo of the same man being attended to but this time with shoes carefully placed by the side of the road. Who placed the shoes there neatly and why? Take a closer look at this picture. In the video online the man’s backside never touches the road underneath (that his hard to do), his knees are up and so is his left arm and hand, he does not seem to move. If he was in pain his knees would be resting on the ground, flopped over to the left or right and so would his left arm. It takes a lot of effort to stay in the position he is in, it is not believable. Look at the photo above, does the hand look real. It is to white, is it a dummy? The video is below which shows this more clearly. Also as you watch these videos going along Westminster Bridge there is not many people injured but we are told that over 40 people were injured, somehow I don’t think so. Video was removed by the Jewish run Youtube, sorry. You have got to ask why? Look at the photo below. If this is a dead Policeman under the white sheet then why is he left alone this is supposed to be a crime scene, why is it not cordoned off with tape? Why is the ambulance empty? Why is the member of the public attending to the dying Policeman but the Doctor and Paramedics are just watching? In the photo below look at the man with the blue gloves he is holding the Policeman up by his feet now the Policemans head must be touching the floor. Why? We are told there was 44 victims? In the photos below were are these victims? London has more CCTV per square mile than any city in the world, so where’s the footage of this incident? The CCTV cameras for Westminster were taken off-line during the attack. CCTV offline? Again? It’s the same old story, just like London 7/7 underground bombings, no CCTV. CCTV on board the bus that blew up was also offline. The same Israeli Company who ran 911 airport security (No CCTV), ran the London bus CCTV during the attack. Of course they were taken offline as they don’t want the people who monitor the CCTV to see what actually happened on the Bridge. This alleged car that came onto the bridge must have came from somewhere in London. So where is the CCTV of this car approaching the bridge from its starting point, well they can't show it can they. London has more CCTV than any city in the world per population. The main gate into the grounds of parliament was left open and reportedly nobody was guarding the gate. Normally these gates are always kept shut. Why was the main gate into the grounds of parliament left open and why was nobody guarding the gate? 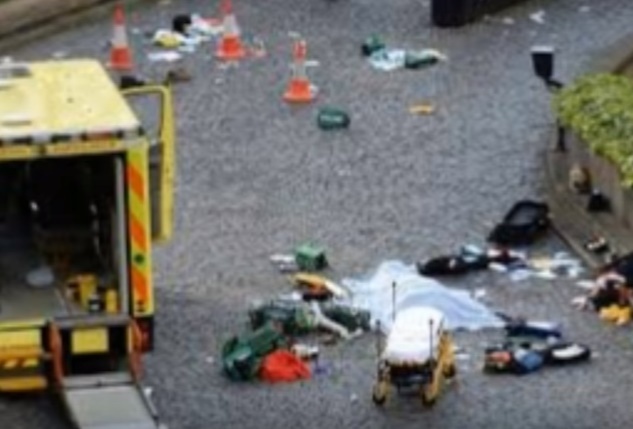 There are claims that no-one was on duty on the gate when the attacker entered. That place is a fortress. There is no way anyone could get into that area. There are armed guards at every entrance. At least four staff are usually stationed at all the gates, two outside and two inside. How did he get inside those gates? No one can enter that region. How could he knife down a constable? The London Eye was stopped during the Westminster attack for 3 hours. Whoever was behind the attacks had the London Eye stopped because if someone on the London Eye took a video of what really happened on the bridge then got off the London Eye with this evidence and disappeared, the this evidence could be the used at some point to prove the hoax. To stop this happening the London eye was stopped and as people got off their phones were checked by the Police to make sure they had no evidence of the alleged car driving along the bridge at high speed. There was first news of the assailant being a Mr. Abu Izzadeen but later identity of killed assailant was given as Khalid Masood. The man originally alleged to be the main attacker, Trevor Brooks aka Abu Izzadeen, has links to MI6. The media found out they made a blunder and that Abu Izzadeen was alive in jail. But there is no real blood anywhere, including on the knife which was used to stab a Police officer. Where are the bullet wounds? His eyes are open, is he dead? Where is all the blood? The terrorist was shot – not taken into interrogation, because he had to be disposed of – as in Nice, Berlin, Paris 13 Nov. 2015, Brussels 3/22 2016 etc. Maybe that is why they always kill him or get him killed: So that the alleged perpetrator isn’t alive to explain what really happened. At first, there were two assailants:”The BBC understands from multiple sources that two assailants were in the vehicle on Westminster Bridge,” BBC correspondent Dominic Casciani said on Twitter. What happened to the other guy? Another sign of a false flag is the “iconic date,” often featuring the numbers 9, 11 or 7 or multiples thereof. The London bombings happened on 7/7 and we of course we have 9/11. The Westminster attack happened on 3/22, the first anniversary of the false flag attack in Brussels Airport which was also 3/22, 3+2+2=7. 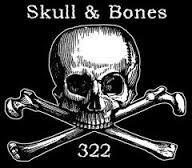 322 is a big time satanic number and date, is the identifier of the Skull and Bones secret society of which many American Presidents were a member of. In the recent terror attack at Manchester Arena, the date was 22/05. 2+2+5=9. The truck attack in Stockholm, Sweden happened on April 7 th. 7+4=11 and the Berlin truck attack happened on the 9 th. Is it all just a coincidence? Believe me the same organisation planned all the attacks and then convinced some patsie to carry it out and it was not Isis or Al Qaeda. The Illuminati and its intelligent (Psychopaths) agencies such as Mossad, CIA, MI5 and MI6 were behind all these attacks. What are the chances that the 8 attacks below spread out over 6 years in 6 different countries would all be carried out on the 22nd of the month? It is not possible that these were random events. Just to note that the 22 nd is a very significant date for the Jews because that was the date they blew up the British headquarters at the King David hotel (July 22 nd, 1946) and killed 91 civilians. Also these Jewish terrorists tried to make people believe that the Arabs did it (akin to 9/11) by dressing up as Palestinian Arabs to plant the bombs. In July 2006 Netanyahu and former Irgun gang members attended a 60th anniversary celebration of this outrage and continue to claim that it was all the fault of the British and not the fault of the bombers. Every major terrorist incident has had terror drills or training at exactly the same time as the terror incident was happening. 9/11 did so did 7/7 London, Boston, Paris etc.. and so did Westminster. Every terror event from Manchester to Nice seems to get blamed on ISIS or ISIS claims responsibility. Did you know that an Israeli group SITE (Search for International Terrorist Entities) always announces first that terror events like Westminster, Manchester and Nice were allegedly done by ISIS. Can we really believe them? In fact any ISIS related news come from SITE first. It is run by a Jewish woman Rita Katz whose father was a Mossad spy. Look at this message that SITE tweeted before the Westminster attacks, seems they knew this would happen before it did. Well that’s no coincidence when you realise that ISIS was created by Israel and America. Or maybe it was just a Mossad (Israeli Intelligence) operation from the start. Click on the ISIS section of this website to see more information on that. Why do these events happen? My research says the ones behind the planning of this event were Mossad (Israeli Intelligence) with the help of MI5 and MI6. It is a psychological operation to keep in the minds of the masses of people and politicians that the Muslims are the real threat and that gives Israel the support it needs to slaughter the Palestinians and gives a legitimate reason to keep the wars in the Middle East rolling along, more Muslims slaughtered (4 million since 1990). But there are other reasons. After the Westminster attack Home Secretary Amber Rudd has demanded more action from social media such as Facebook, Twitter, WhatsApp and Youtube to take down extremist videos, really she means videos that expose the false flag lies so no one will be able to find out the truth. She said new proposals are going to be implemented by the government to make internet giants take down so called hate videos. But in reality they are not hate videos but truth videos that try to expose the lies of the government. Also in government plans in the wake of this alleged attack is to deploy 5000 soldiers on the streets of the UK. This secret plan is codenamed Operation Temperer. The attack stopped parliament from voting on leaving the EU. So it disrupted the Brexit debate. Terror attacks also keep us divided especially Muslims and Christians. These terror attacks are happening in Christian countries in Europe and America and we are told the perpetrators are always Muslims. But who would profit from Muslims and Christians hating each other? Could it be the people of Asia or could it be the Jewish Zionists? Could it be a prelude to the coming Economic Collapse? France announced that in the wake of the so-called “Charlie Hebdo Shooting,” it passed a controversial new bill granting security agencies unprecedented powers to tap the communications of France’s population without judicial overview. This would have been Impossible to pass without having the Charlie Hebdo Shooting. Once again, CCTV cameras were missing, drills and events that mimic the event played out just days earlier, and, the aftermath, the loss of personal freedoms and freedom of speech, plus troops on our streets being proposed.